Click/tap here to find the best Vermont yoga instructor for your needs! Experience Yoga offers group classes, private yoga sessions for individuals, couples, friends and small groups, and corporate workshops for yoga, wellness, stress management, and mindfulness. Experience Yoga also offers healing energy work through the offering of Reiki. A private yoga session allows problems and concerns to be addressed personally and appropriately, and then followed by or augmented with working in a group class. It can also be a nice way to begin, support or advance your own personal practice. A group class is fun and beneficial while still offering supervision and the availability of limited consult. Joining a yoga Sangha brings great joy!. Experience Yoga offers specialty classes such as (but not limited to) focus on hip opening, back pain, restorative classes, or partner yoga. These classes may be one session or a limited series. A class can be custom design to meet the goals and needs of your group. Welcome to Studio for Life! Studio for Life offers daily and private Yoga classes as well as Massage and Reiki sessions. Studio for Life is located in a two-story, vaulted room in a contemporary home that enjoys panoramic views of the Northeast Kingdom. Sessions are provided by Vermont native, Rebecca Marcotte. Rebecca is a Registered Yoga Instructor, Massage Practitioner and Reiki Master. Rebecca primarily instructs with Hatha and Restorative techniques. She incorporates Swedish style into her massage practice. I am a YogaFit certtified instructor. I teach age 18 months - adult through The Ballet School, St. Albans Recreation and many other sites. I offer both on going classes, camps and one time services. Ananta Yoga~ Sanskrit for "uncovering your unlimited potential". Offering a specialty in Chair-Supported Yoga, Gentle Yoga, Hatha Yoga for Peace and Well-Being, Tot's Yoga (ages 21/2-5 year olds)through teens. Founder and Director of Vermont's first Yoga Camps for Children: "Girl Spirit Creative Yoga" Summer Camps and Workshops and "Kid's Creative Yoga" Camps and classes. Ananta Yoga is offered through Parks and Recreation Departments in Chittinden County, VT: South Burlington, Burlington, Colchester, Essex Junction, Hinesburg, Milton, and Shelburne. Please check Park-Rec. websites in your area for specific adult and childrens offerings. My focus when teaching my adult classes is to help each student to enjoy an accessible and personal yoga practice regardless of their body's past history. By offering personalized posture modifications, introduction of props, and positive affirmations, postures becomes unique to each individual. My summer camps, classes and workshops for children were created and inspired by the belief that all children are perfect just the way they are! Classes offered in Hatha, Vinyasa and Power styles. Instructors vary with date and time. 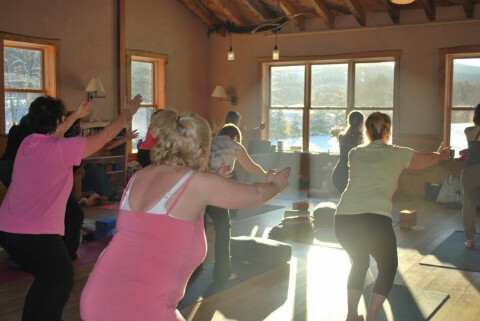 Anusara inspired yoga classes and private yoga therapy for all levels in Killington, Vermont. Offering group and private Yoga instruction, Integrative Yoga Therapy, Yoga-based Coaching and Thai Yoga bodywork. For people at all levels of experience and ability.